Downstairs/main floor has two bedrooms. One with queen with beautiful view of the lake. One with two twin beds. Upstairs: loft with trundle bed (two twins), one bedroom with 2 twins. Great place to stay for a relaxing vacation. Home is very well maintained, clean and comfortable Kayaks and paddle boat were great to have. World Class View in Well-Kept Property! This is a really pretty property and truly, the photos do not do the place justice. An open floor plan allows you to look out on the amazing lake view from the large living room, dining area, kitchen and sunroom. The house is well-equiped with pots, pans, dishes, glasses, cleaning and paper products. Entry is easy -- the parking area is just a few steps away from the door which is not always the case at a lake house. Plus, one of the best things about this lake house is that it was obviously designed with simple cleaning in mind which is what you want when you are on vacation. Track in some dirt or sand from the beach? No problem! Attractive tile floors are easily swept or vacuumed and things look perfect once again. The deck is large and well-maintained and, as a gardener, I loved all of the flowers in pots and hanging baskets around the property. I could wish the bathroom was a wee bit bigger but, it wasn't really a problem. The owner was quick to respond to questions and very helpful and we hope to come back next year and stay longer than a single week! Meredith is a great town -- shops, restaurants, close to I-93 and there's a lot to do within a 60 minute radius of this property if you want do a bit of exploring. Lake Winnisquam is pristine and if you like fishing or water sports, you'll be very, very happy here. Great lake house to rent. The owner is awesome to work with. Definitely a great vacation spot! My family had a wonderful week at this property. The house was beautiful and comfortable and the view of the lake was extraordinary. Well equipped home with a quiet, sandy beach, paddle boat and kayaks. Short drive to town for amenities. Very peaceful, great for families with kids and pet friendly. Highly recommended. Well same title as last year. What more can I say? This was our 2nd year at this Home. I say Home because Diane has really decorated and outfitted it as her own home with tasteful decorations and flowers all around the property. The layout is terrific with loads of space. Big open entryway for vacation bins. Wonderful food pantry closet with lots of shelves. Fridge is nice and large and if you are like us, we keep coolers on the deck stuffed with assorted drinks to keep kiddies in and out of the fridge. Plenty of cabinets with any utensil, plate or tool you would need but still room for your stuff. Forget a spice or cooking need? Check the cabinets. The kitchen is easily large enough for 2 cooks and the breakfast bar (3 stools) allows people to sit on the opposite side and help prep. The separate dining room table (expands to hold 8) is right next to the kitchen and for those who want to eat outdoors (so nice) there is loads of deck space. Sink is a bit small but the dishwasher easily accommodates large loads. Microwave above the stove opens up counter space. Bedrooms have plenty of storage space and ceiling fans on 1st floor. The new magnetic screen "door" is Awesome. Keeps out the bugs and no shouting "Close the screen". Living room is VERY large and we use the sun room as a place for the grandsons to put their board games and such. Basic cable but wireless internet is solid and allows you to use your fire stick or equivalent. The Deck is THE gathering place. Not enough chairs? Check out the closet. Diane has extras in there. Worried about bugs? Bring out a fan it drives them away. She has extras of those too. The 15 foot walk to the water is a bit rocky but navigable. Want some quiet? Go sit in one of the comfy chairs down by the beach or have a campfire in the fire pit. Be sure to bring plenty of floaty toys as this beach is the best place to enjoy the water with a drink in hand. Want more to do? Kayak or paddle boat around Loon Island (it's up for sale), or up to the Loon Sanctuary. No wake zone so no speedboats. Meredith and the north end of the big lake (Lake Winnipesaukee) with all its shops and restaurants is only 15 minutes away. Want a great breakfast, check out the Rte 104 Diner just 10 minutes away. Nice sturdy aluminum dock easily handles my 22' pontoon. And when the family all goes home...Ahhh The Quiet! Enjoy! . I'll be honest, we have visited many other places and we really have a great time here. 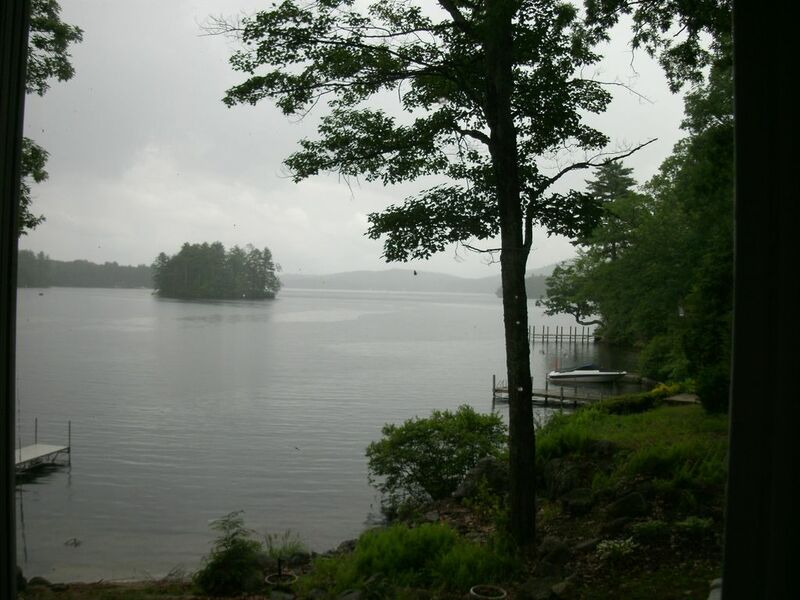 Spend your vacation on one of the most beautiful lakes of NH. This lovely home is situated in a quiet area with it’s own private beach and dock. Swim, fish, bring your boat or rent one and enjoy our kayaks, paddle boat, and floating devices. You will love sitting out on the deck which has a spectacular view. Perfect for relaxing, socializing, or a bbq on the gas grill. Nice quiet sitting areas by the dock as well. Perfect for families with young children. The parents can relax while the kids play in the water.